I am a working mom, and I love it. Me and the two littlest on the last day of preschool! I’m not here to debate the hot topic of Working Mom VS Stay at Home Mom. I’m here to take out the VS all together. I am blessed to have what I consider to be the best job in the world. I am the director of a private Christian preschool where my two littlest attend school. I work four days a week from 8am-3pm. I get to pick up my biggest from elementary school every day. I get to peek in on my babies in their classrooms and see them in the halls all day long. I can step in and kiss their sweet cheeks while they’re napping in the afternoons. It really is the best of both worlds. But I know not every mom is in the same situation. Some of you want to stay at home, but you have to work to make ends meet. Some of you want to work but you can’t find employment. Some of you work a job you hate, just to provide for your kids. Some of you have a job that you love, but it takes you away from your family more than you’d like. Some of you gave up a career to stay home, and now question your decision. Some of you love the season you’re in. Some of you are struggling just to get through each day. Whatever place you find yourself in, mamas, I want you to know that there is no judgement, no competition, no condemnation here. I get so tired of feeling judged/sized up/analyzed by other moms who may have chosen a different path than me. Can we just be honest? No option is perfect. There are things about being a mom in the work force that are super hard. 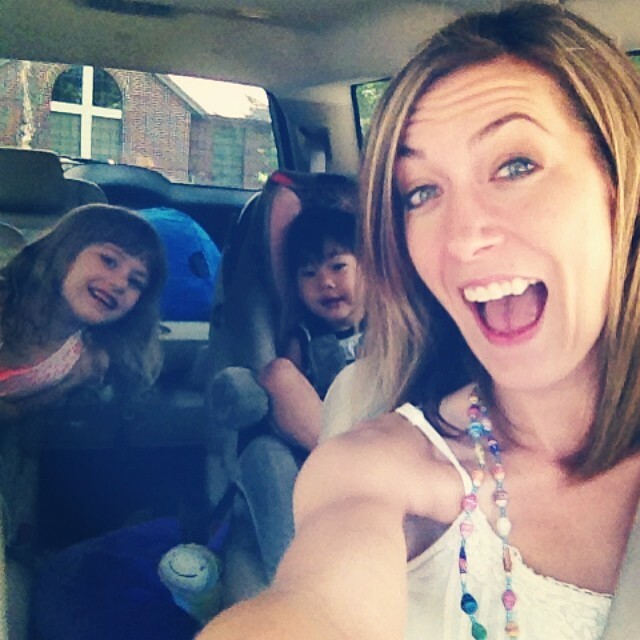 There are things about being a stay-at-home mom that are super hard. Can we just all agree that regardless of the details, being a mom is hard? Are there days when I wonder if I should just quit my job and stay home to cut out some of the chaos and craziness that being a working mom causes? Absolutely. Have there been seasons where I’ve questioned the choices I’ve made and how they impact our kids? For sure. Is my decision to work while raising a family something that could change one day? It’s possible. You see mamas, there is no manual that comes with parenthood that helps us figure these things out. There is no formula for raising your kids without screwing them up beyond repair. There is no book, seminar, video series, blog or life coach that can tell you whether you should work or stay at home or do a bit of both. So I’m not here to say that my decision to have a career is better than someone else’s. I’m not apologizing for pursuing my personal dreams and desires while encouraging my littles to pursue theirs as well. I’m not complaining that I have to work so that you will feel sorry for me. I am confessing that I love what I do, and if you do too, then I applaud you. To all the stay-at-home mamas who spend their days loving and teaching and playing and experiencing life with their littles, you’re amazing. To all the moms who work part-time to give their kids the opportunity to play sports and take dance and go to Disney World, you rock. To all the moms who have a full-time career and manage to be at their kids ballgames and make dinner and read bedtime stories, you’re my heroes. To all the moms who are unsure of whatever it is they are doing but are still loving and giving and serving and working in spite of their restlessness, keep doing what you’re doing. To all the moms who are in a season of struggle and hardship and wondering if things will ever get better- you’re incredible and you need to know that seasons always change. Being a mom is hard enough on it’s own- there is no need for judgement that makes us feel even more insecure and unworthy than we already do. Let’s create a community of honesty in motherhood where we can admit our struggles and our differences, and embrace each other regardless. Let’s say, “Hey, we’re different, and that’s ok.” What you do may be right for you, but it might not be right for someone else. What you have the ability to do might not be a possibility for someone else. What makes you feel fulfilled and at peace with yourself may not be the same for someone else. Whatever we choose to do as mamas and as women, let’s cheer each other on and offer encouragement and support. Because whatever we choose, there will be days when it seems overwhelmingly hard, and the reality is, we need each other. So working moms, stay-at-home moms, or moms somewhere in the middle, let’s take our eyes off of what everyone else is doing, pray fervently that God would guide our steps, and walk with confidence in our individual callings, while embracing the differences in this incredible sisterhood. No more mommy wars. No more X vs Y. Just you, me, us, in this motherhood thing together, for better or worse. Well said! Wish we could erase every “vs” topic when it comes to being a Momma! Amen, sister. No versus necessary!